Action-packed and brutal, Sick is the archetype of young-adult zombie fiction with an intelligent background. What would you do when one of your schoolmates all of a sudden starts nomming your drama teacher? The world has turned upside down for Brian and his friends, when an infection gets on the loose inside their fenced-in school. It turns innocent drama geeks into hunched-over monsters with no concern for their own safety, and Brian is stuck in the middle, his sister and girlfriend on campus somewhere. When you’ve read one zombie book set in a high-school, you kind of know the drill. The kids can’t rely on teachers (since they are usually the first to go down) and hole up somewhere, and eventually try to fight their way out, maybe trying to save some loved ones in the mean time. When the book is also suspenseful, you’ve got your standard zombie book. It takes originality and heart to make the book good, and Sick delivered that. Apart from the zombies in Mira Grant’s Newsflesh series, I haven’t come across a believable explanation for zombie-ism. 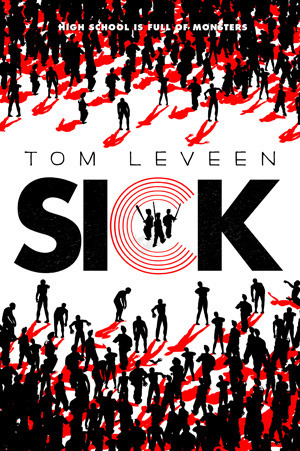 Sick provides an interesting new angle – instead of zombies being the walking dead, they’re humans in so much pain that they don’t act as humans any more. Once the human is dead, the zombie won’t get up. The monsters are still human, and I loved how Brian still sees them as human. It brought along a whole set of emotions for him; are you allowed to kill another human being to save your own life? This is usually glossed over in zombie fiction, where they see zombies as essentially dead humans, with no chance of rescuing them. Brian is of course part of the leaders of a small survivors pack. The power dynamics were quite realistic, but weren’t much of interest to me. Neither was the discussion whether or not the army was coming. Everything from the extremely locked up school to that kind of political struggles are so thoroughly American and therefore alien to me that it kind of goes past me. My school had a gate that went to about your navel. It didn’t have any security except for the school’s assistants that also figured as concierge. There was no sneaking out, you just walked away if you wanted to skip class; the gates only closed at night. My personal experiences are so opposed from Brian’s that the first few chapters didn’t hook me. When disaster strikes though, I got engaged in the story of Brian looking for his sister and girlfriend. The book is the perfect length – long enough to get some feels in there, but short enough so the action isn’t drawn out. Fans of zombie fiction will eat Sick up. Brian and his friends are not part of the cool crowd. They’re the misfits and the troublemakers—the ones who jump their high school’s fence to skip class regularly. So when a deadly virus breaks out, they’re the only ones with a chance of surviving. The virus turns Brian’s classmates and teachers into bloodthirsty attackers who don’t die easily. The whole school goes on lockdown, but Brian and his best friend, Chad, are safe (and stuck) in the theater department—far from Brian’s sister, Kenzie, and his ex-girlfriend with a panic attack problem, Laura. Brian and Chad, along with some of the theater kids Brian had never given the time of day before, decide to find the girls and bring them to the safety of the theater. But it won’t be easy, and it will test everything they thought they knew about themselves and their classmates.